Yet again … is it right or wrong for a soap to kill off a child? I led a column with this perennial question several weeks ago when Delia Abbott was killed on The Young and the Restless, reiterating my longstanding opposition to what I regard as a creepy plot device that exploits the worst nightmare of mothers everywhere, many of whom historically form the backbone of soap viewership. But that’s just me, and as it turns out lots of viewers disagree. There was a tremendous response to the column: a spike of several thousand hits above the norm here at Marlena De Lacroix: Soaps for the Thinking Fan, plus almost a hundred letters, breaking at about half pro and half con. Y&R earned the biggest prize of all: close to a record five million viewers for this most controversial storyline of the year. It’s hard to argue with such success, so I’ll concede this much: if Y&R had to do this story, at least they did a fine job of it. The writing, acting and production all were first rate. The death of Delia touched almost every character on the canvas. As the grieving mother Chloe, Elizabeth Hendrickson brought tears to the eyes. 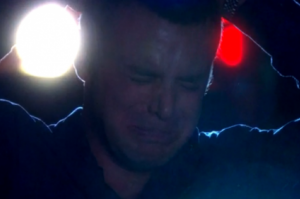 The grief of the father, Billy (Billy Miller) was made worse by his knowledge that, just prior to the accident, he had left the child in the car when he went into a store to get some ice cream. Any parent could relate to his crushing feelings of guilt, expressed so movingly in his later scenes with his hysterical mother Jill (Jess Walton). The death of Delia brought the leading Abbott family together. Jack and his sisters Ashley (Eileen Davidson) and Tracy (Beth Maitland) came to town. Ashley brought muffins for a scene Y&R watchers have grown to love as tradition: the Abbott family breakfast. Jack (Peter Berman) was shown to be the new head of the family, a fact that was remarked upon by Jack’s dead father John (Jerry Douglas), who appeared only to Jack. The warmth of the family gathering went a long way to assuage the pain of Delia’s death, although the pain will never go away. And there’s more. Also shown in a great deal of pain was Adam Newman (Michael Muhney), the man who apparently (and up until now secretly) ran over Delia. He kept this knowledge to himself, even after parts of Delia’s eyes were successfully transplanted to Adam’s newborn, almost blind son, per Chloe and Billy’s permission. Adam hasn’t even been able to enjoy the success of this operation. All along he has been debating confessing his guilt. This week he may even do so. Will Adam Newman ever be happy? Here’s a question that has haunted the character ever since he came to town as the son of Victor and the blind and deceased Hope several years ago. First he loved and lost Sharon (Sharon Case). Then he loved and lost his wife Chelsea (Melissa Claire Egan). Now he may go to jail for a decade and miss his son’s growing up years. Adam Newman’s life is perpetually a tragedy. Not as great as the death of Delia, but certainly a story that is ongoing for the recent run of Y&R. The soulful Michael Muhney has his work cut out for him. Happily for the viewers, he seems to be up to the challenge.